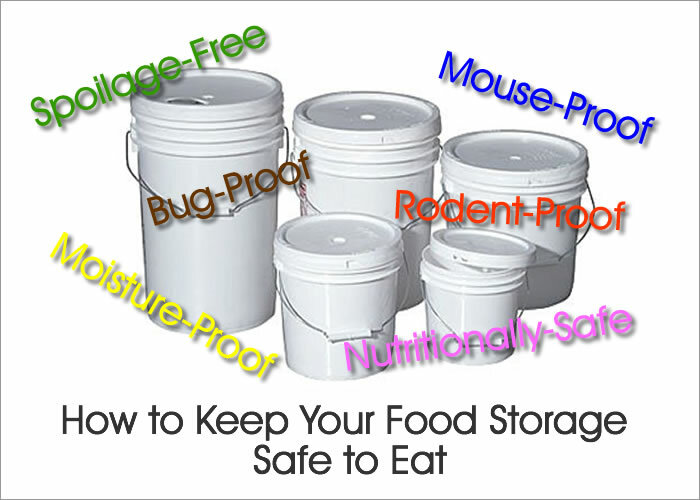 Safe food storage means keeping out bugs and rodents, eliminating heat damage, and preventing rust from destroying your bulk food storage containers and still be able to eat that food in 25 years. In order to keep your food fresh and nutritious, it's best to keep the food cool — your storage area needs to be as cool and dark a place as possible. Light and heat can destroy not only the taste and texture of your food, but also the nutritional content. Where is the best place to store your food to keep it cool? Since heat rises, a basement or cellar will keep it much cooler than keeping it on a top floor or in an attic. You can also put it underneath beds, or on closet floors. Other suggestions: place boxes of #10 cans on their side behind a couch or create side tables or night stands by placing a table top and a decorative cloth over the bulk food storage buckets. Consider these possible issues when deciding where and how to store your food supplies. If the food was safe when you bought it, and if it doesn't show any of the following signs of spoilage, then the food should be safe to eat. If any of these signs are present, throw the food out without tasting it! A milky appearance to the liquid. Corrosion on the inside of the can, especially along the seam. Rust, especially along the seam or seal of a can. Rancid odor, especially in foods which contain any amount of fat. Mold growth on the food or inside of the container. Make sure home-bottled food is processed properly. If improper processing times, methods, and/or recipes were used for home-processed fruits, vegetables and meats, the jar may be sealed but the product deadly. Apply the checklist safety tests above before eating. In order to truly have safe food storage, you have to prepare for the possibility of bugs and rodents. When you buy pre-packaged food in bulk food storage containers, it usually comes in either #10 cans (metal) or plastic 6-gallon buckets. It is easier to keep food fresh and safe in the cans as it's almost impossible for light, bugs, or rodents to get into a sealed metal can. As long as you keep it cool, the food contained in these cans will stay fresh for years. The six-gallon buckets are a bit more of a risk but there are precautions you can take to decrease the risks. Bugs will not be a problem with plastic buckets as long as they are kept sealed and have no damage. Damage can still come from rodents who can gnaw their way in, thereby leaving an opening for bugs. If rodents can smell the food, they WILL gnaw through the buckets. If you bought your grains or beans by the bag, preparing them for storage ensures insects do not take up residence in your foods. To fumigate home stored wheat or similar products, place 1/4 of a sheet of dry ice (1/4 pound) in the bottom of a food grade, sealable plastic 5-6 gallon container and fill 3/4 full with grain. Set a silica packet (to absorb moisture) on top of the grain and set the lid lightly in place, but do not seal it. Some people like to place a couple of dried Bay Leaves in the container at this time also. In about 2 hours you can usually seal the container. The dry ice will turn into CO2 gas and displace the oxygen in the container. This process should be done in some place out of the wind, so that the CO2 gas, which is heavier than air, stays in the container. If you seal the lid too soon, the lid could blow off or the container might rupture. Should pressure cause bulging of the can after the lid has been put in place, remove the lid cautiously for a few minutes and then replace it. If using Mylar bucket liners, don’t seal them until the dry ice has vaporized. Carbon dioxide will stay in the container for some time, provided the container lid is tight. Your food container would now have had most of the oxygen removed, and should stay dry. Also, any insect eggs should have been (hopefully) killed. Dry ice tends to control most adult and larval insects present, but may not destroy all the eggs or pupae. If a tight fitting lid is placed firmly on the container after the dry ice has vaporized, it may keep enough carbon dioxide inside to destroy some of the eggs and pupae. 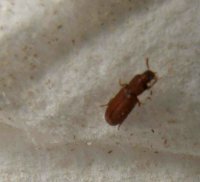 After 2 to 3 weeks another fumigation with dry ice may be necessary to destroy adult insects which have matured from the surviving eggs and pupae. If properly done, these two treatments should suffice. Yearly treatments are not necessary unless you notice an infestation. Signs of an infestation might be cast off skins or tiny crumbs of food. Once the container is sealed, the food should keep safely for many years. Why use oxygen absorbers? While these little packets work similar to dry ice in removing oxygen, they do not handle the bug problem. The purpose of oxygen absorbers is to maintain the freshness and nutritional value of food products for long term storage. The new U.S. Military-spec packets will remove up to 99.8% of the residual oxygen from sealed containers, leaving an optimal nitrogen atmosphere, without the mess of dry ice and the expense of buying a vacuum packing machine. Why Use Mylar Bucket Liners? Mylar bucket liners add to the safety of your food storage by providing additional protection from light and any toxic fumes such as gasoline, pesticides, laundry detergents and other chemicals that might affect the taste of the food. In order to be completely effective the liners must be heat sealed and combined with the appropriate number of oxygen absorber packets for long term storage. Or use the new (smaller) metalized zip lock foil bucket liner for much easier packing. What If You've Already Found Bugs? Storing susceptible products, like flour, rice, or cornmeal in the refrigerator or freezer for a time will kill the larvae and prevent them from maturing into adult bugs. If you already have found bugs, thoroughly clean the area by vacuuming up any debris (skins or crumbs) and washing everything with warm, soapy water. If possible, put the contaminated food in the freezer for two or three days (or outside in a protected area if the temperature is freezing or below). This will kill the offending insects. After freezing, follow the directions above for preparing the grains or beans for storage. Use the CO2 method again, or use oxygen absorbers, and then seal tightly. In rare cases, the infestation may be bad enough to dispose of the food. If this is the case, be sure to thoroughly clean the area where the food was stored to prevent infestation of other stored foods. To make sure your frozen foods stay safely frozen, read how to this inexpensive little gadget saves frozen foods from unexpected thawing. PARAFFIN METHOD: Using a double boiler, paraffin is melted and brushed on the clean, unrusted cans. Be certain to get a good coat on all seams, particularly the joints. If the can is small enough, it can be dipped directly into the wax. Care must be taken to not cause the labels to separate from the cans. Do not leave in long enough for the can to get warm. Combine 2-3 ozs of paste or jelly wax with a quart of mineral spirits. Warm the mixture CAREFULLY in its container by immersing it in a larger container of hot water. DO NOT HEAT OVER AN OPEN FLAME! Stir the wax/spirits thoroughly until it is well mixed and dissolved. Paint the cans with a brush in the same manner as above. Place the cans on a wire rack until dry. A light coating of ordinary spray silicone may be used to deter rust. Spray lightly, allow to dry, wipe gently with a clean cloth to remove excess silicone. 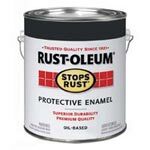 A clear type of spray or brush on coating such as Rustoleum (™) may be applied. This is best suited for larger resealed cans, but will keep them protected from corrosion for years. Living in a humid climate may cause your metal cans to rust. Rust will destroy your food. Quality #10 cans should be double enamel-coated, inside and out, so they won't rust unless they get nicked or dented. Being out in the elements generally makes your cans more likely to rust, but there are a few good spots to keep your food cool, if you're careful. A dry crawl space is one good spot. A garage is another, but a lot of times garages get pretty hot during the summer. If you feel your garage is too hot in the summer, don't hesitate to put your food storage somewhere cooler during those months. One word of caution about this: shifting climates — going from hot to cold and back again — generally isn't very good for your food. Another caution about the garage is you don't want to store your buckets next to gasoline, insecticides, or any other harmful chemicals. Plastic is porous, which could allow some of the toxic fumes these chemicals give off to enter your food. Some people have thought about burying their food storage in the ground, because it would probably keep it cool and secure. Just think of how much work it would be to get to your food storage in case of an emergency (think earthquake!). And trying to dig your food up in the middle of winter? It would also be more likely to rust, or, in the case of buckets, leak. How would you rotate it? Unless you have an underground root cellar, outside food storage is not recommended. The important things to remember are temperature, light, moisture, and unwanted "guests". With a little logic and creativity you can keep your food tasty and fresh for as long as you need—so it will be there when you DO need it. Practicing safe food storage methods will make your investment worth the time, effort and money you put into acquiring and storing it.